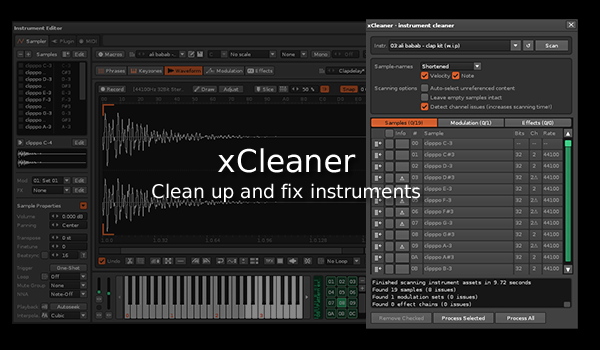 This is the place for discussion, bug reports, and announcements regarding the xCleaner tool. Deleting unused columns in all tracks of the complete song. Also on the left. At least here I often have those empty columns left in a final song. Also columns at the beginning. E.g. if you use the “split into several tracks” tool, the result tracks often have empty columns on the very left. Or if you did double a track with note contents and did some fancy note splitting. Thanks to the lately feature “drag column”, you can quite easily fix an empty beginning column, by dragging the empty one the the very right and then lowering the number of columns. But IMO would nicely fit into this tool. Yes, it’s available in the context menu in the instrument list, but why not adding this to this tool, too? Is there this function available in the API? Put all instruments to "auto suspend"
Detect silence (with adjustable loudness threshold) at either end of sample. How is this done? I cannot find an option for this in the tool. I have several instruments where each sample has silence before and after the actual sample, and I would like to remove this silence. @4Tey: thanks! Those sneaky colons are easily missed. Ah, good of you to point this out. The feature is disabled “under the hood”. Not sure why, but then there never was an option to adjust this threshold to begin with. Awesome! I don’t think I’d need a threshold setting. The silence in my samples is zero I think, so it should be fine. So…here’s a version with leading/trailing silence detect and removal. It defaults to -48 dB as the threshold, which is of course nowhere near “absolute silence”. But often, samples have been processed somehow, and even a bit of dithering could make the silencedetection useless. Check it out, see if it works for you? Nice! A threshold of “-inf” (aka -200) seems to work well for me. I also just had a look at xLib for the first time. Wonderful work! I am tempted to just write a small script that automatizes cleaning and naming for my sampled stuff specifically. I also just had a look at xLib for the first time. Wonderful work! Is there a batch processing for everything in the song, and if not, could you add that? Any possibility of adding peak normalization? Would be pretty nifty.